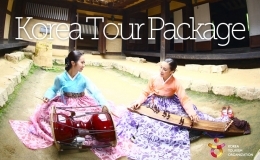 2 night accommodation with breakfasts and lunches at local restaurants during the tour. 2 Full days seat-in-coach tours. 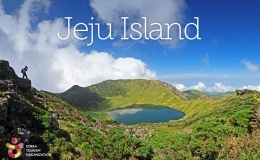 Domestic flight tickets (return) between Seoul and Jeju (Economic class). 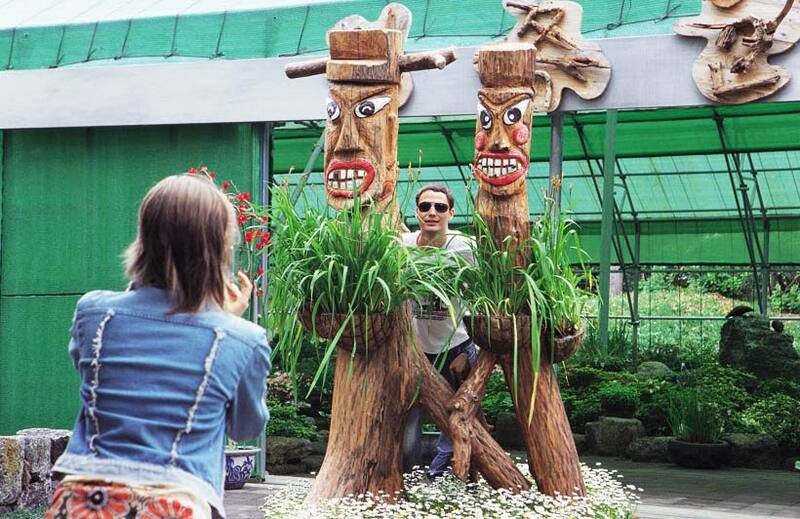 * Tourists must arrive at Gimpo Airport on Day 1. 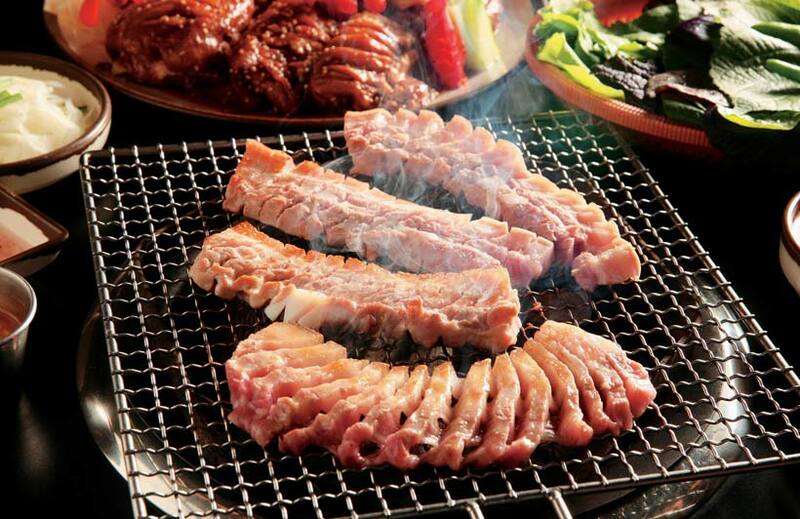 * Surcharge will be applied for summer peak season and Japanese public holidays. 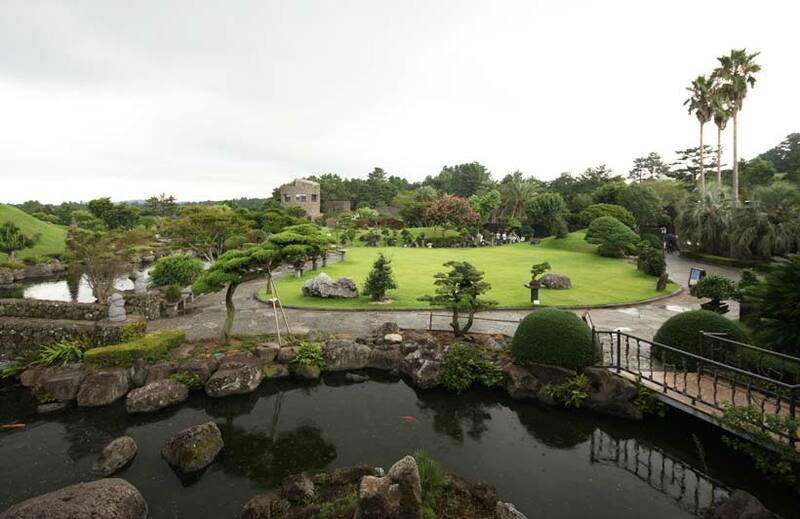 * Private transport available with surcharge – Between Gimpo or Jeju Airport and hotels in Seoul or Jeju. Upon arrival at the airport, you need to make your own way to the hotel. After check in, the rest of the day is free at leisure. 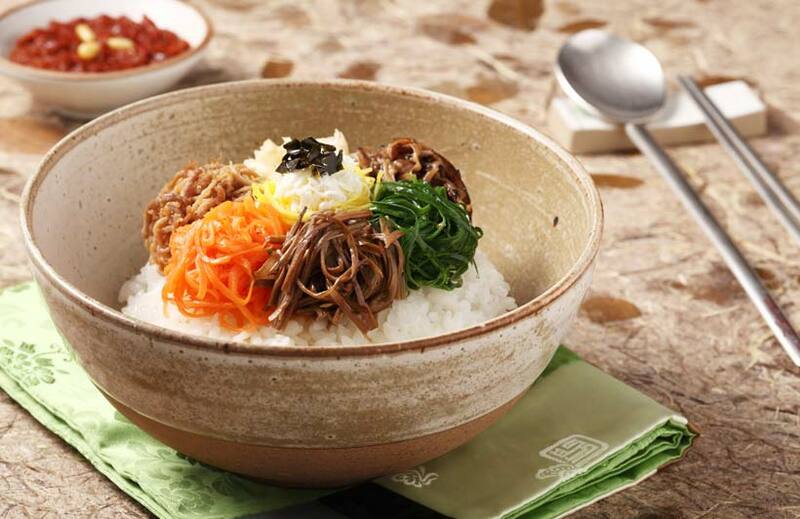 After breakfast at the hotel, you will experience either East or West course tour depends on the date. 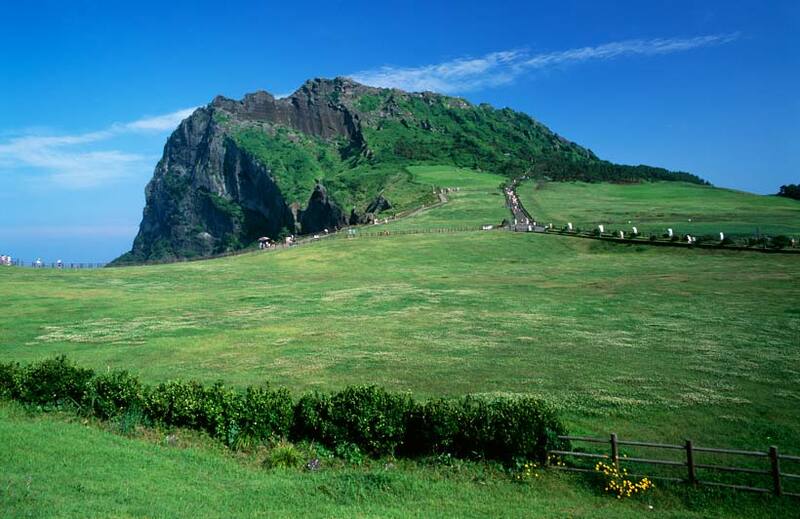 You will be dropped off at the Jeju airport after the tour. 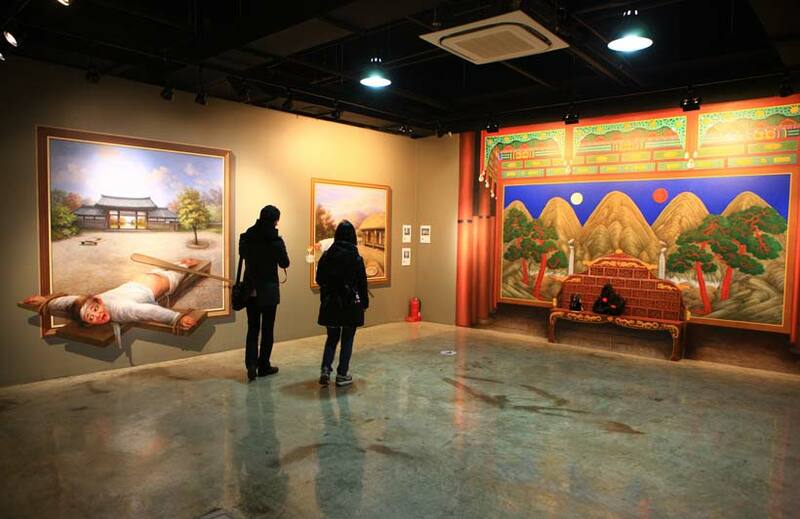 The Trick Art Museum is the first museum in Korea to show optical illusion art, and is located in Seogwipo City near the Seongeup Folk Village. 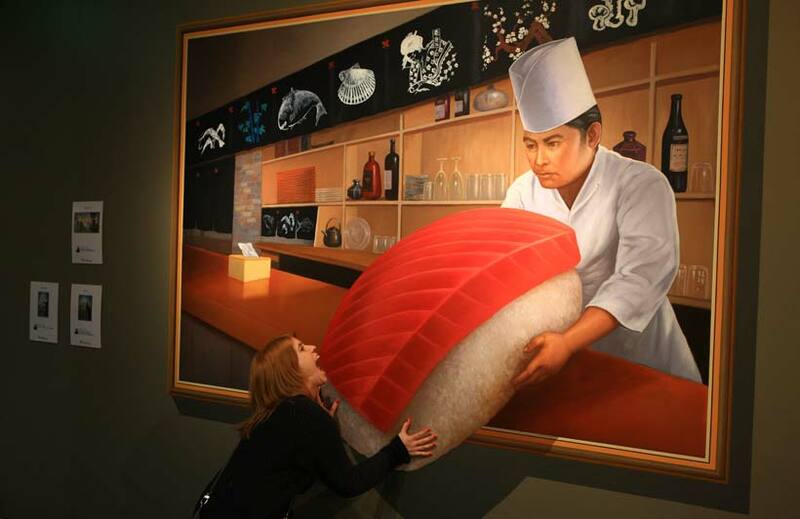 Exhibitions on walls and floors are designed in 3 – dimensions. Sangumburi is a flat crater with a circumference of over 2 km, about 650 m wide, 100 m deep. 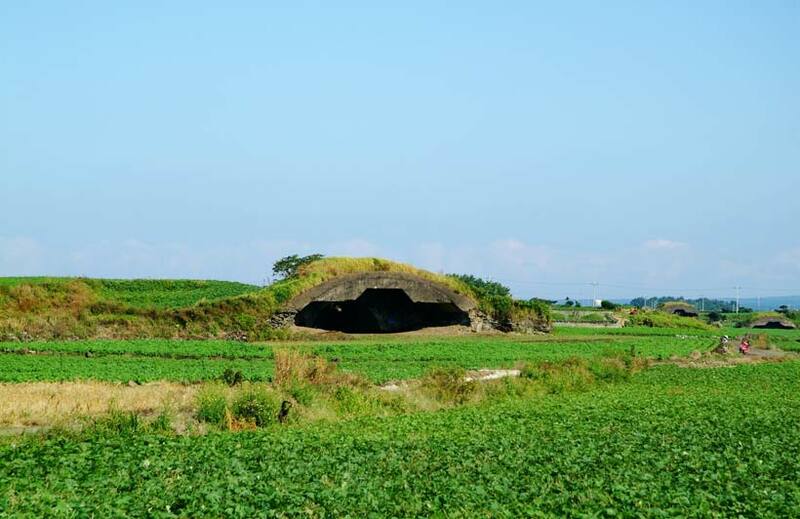 It has been designated as a Natural Monument. 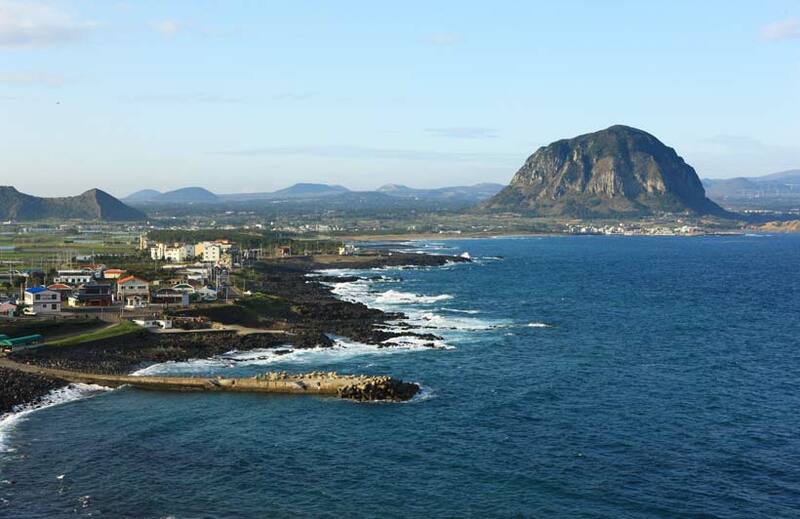 It is located on the South – East side of Jeju city. It looks like a man – made circular stadium from above. 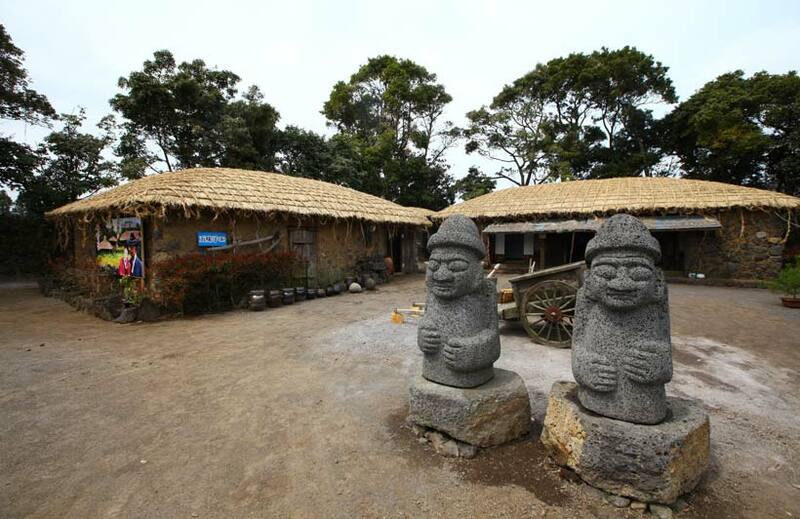 Seongeup Folk Village shows the unique culture of Jeju Island – the black lava rock walls, the straight but curvy alleys to block wind, and Harubang (stone grandfather statues), which have become a representative mascot of the landscape. 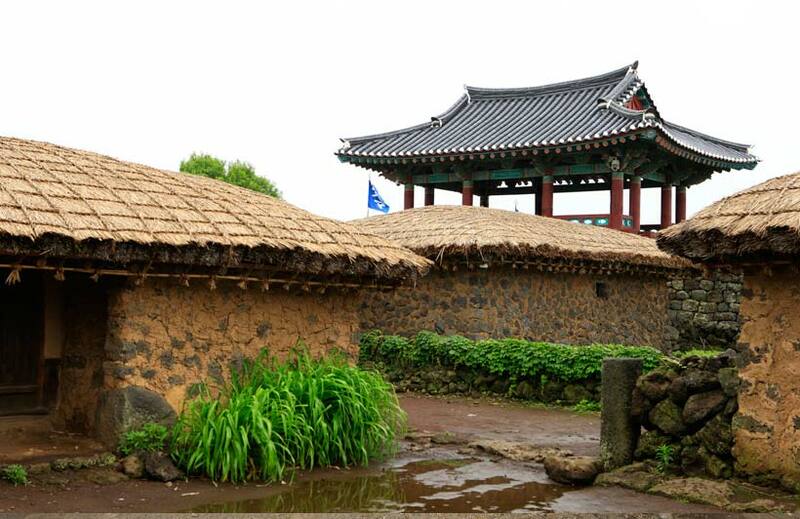 The local black pigs and tongsi (pigsty) are well known characteristics of Jeju folk culture. The local black pigs are also known to be very nutritious. 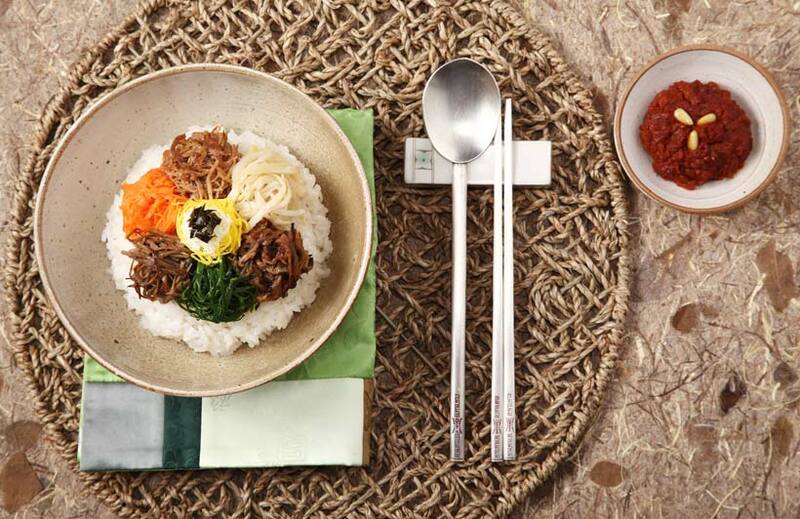 You will delicious local food of Jeju Island. 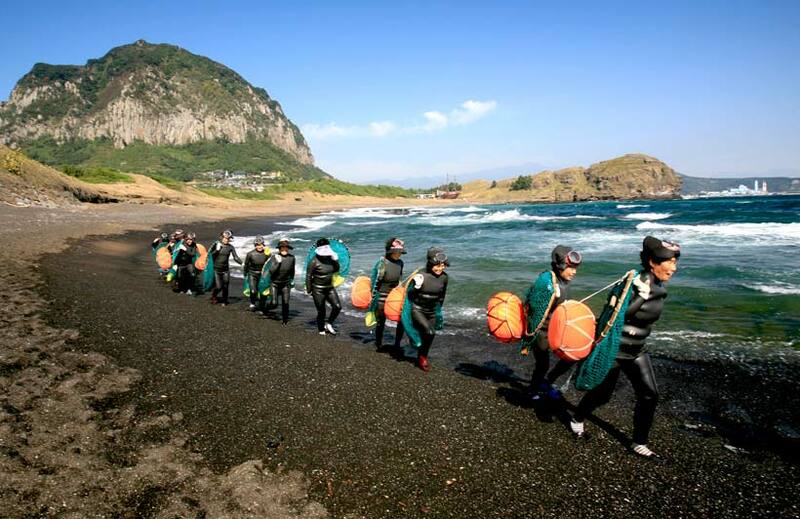 Female divers are one of distinctive symbols of Jeju Island. They have dressed in black rubber diving suits and have fought cold water waves of the sea. 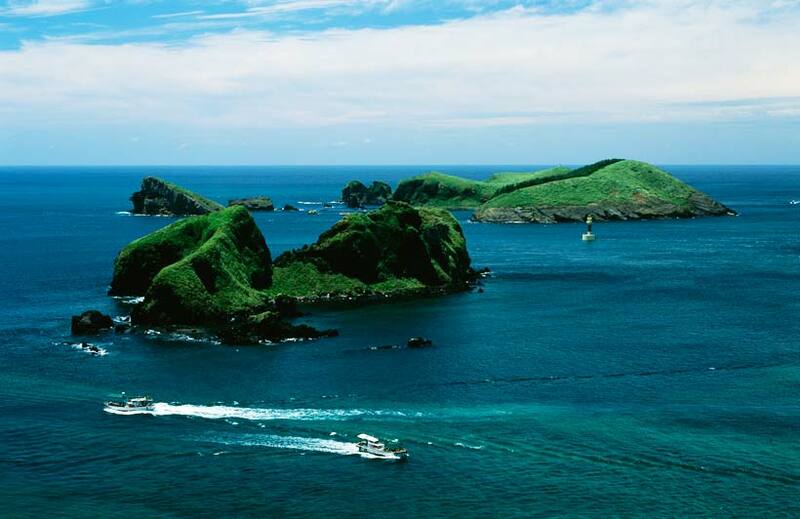 You will have the opportunity to see them, taste fresh seafood that they have just caught, and take photographs with them. 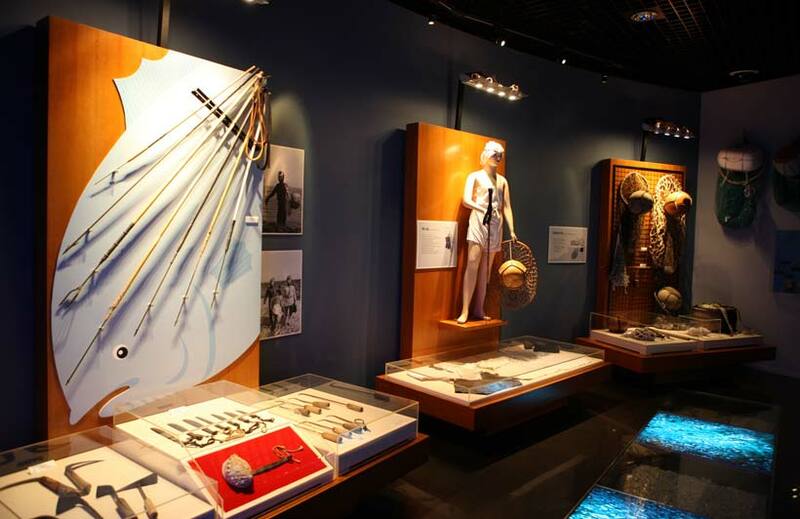 Haenyeo refers to female divers who dive into the ocean water to catch a variety of seafood (including shellfish, seaweed, etc.) without using any underwater diving equipment. When Haenyeo dive underwater, they only carry a pair of goggles, a round ball, a looking tube for balancing, and a basket to carry what they collect. 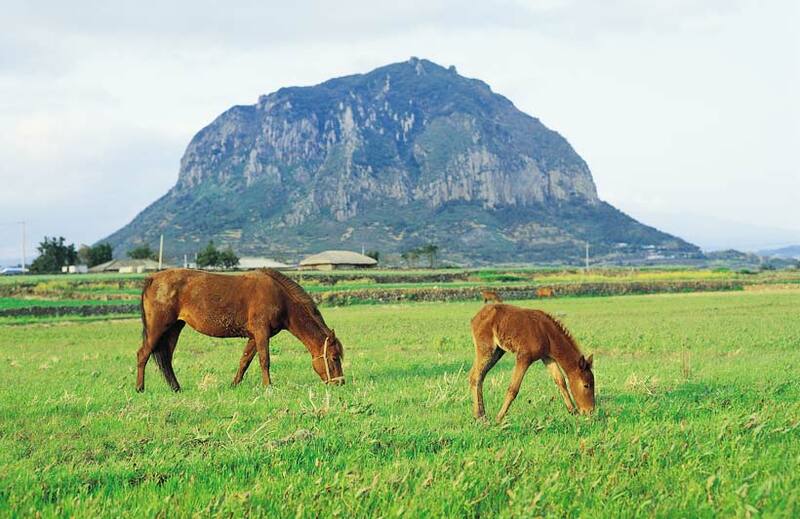 Seongsan Ilchulbong Peak rose from under the sea by volcano eruption over 100,000 years ago. 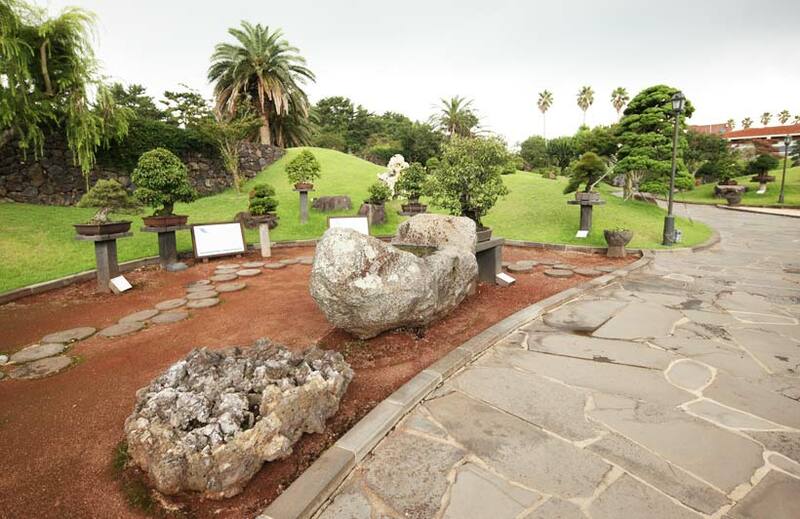 It is located on the East – end of Jeju Island. There is a huge crater at the top of Seongsan Ilchulbong Peak. The crater is about 600 m in diameter and 90 m high. With the 99 sharp rocks surrounding the crater, it looks like a gigantic crown. 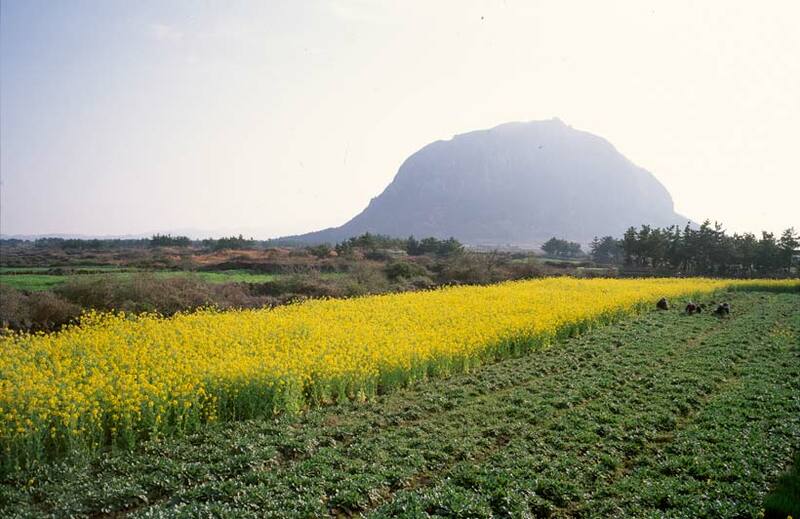 South – East and North sides are cliffs while the North – West side is a green grassy hill that is connected to the Seongsan Village. 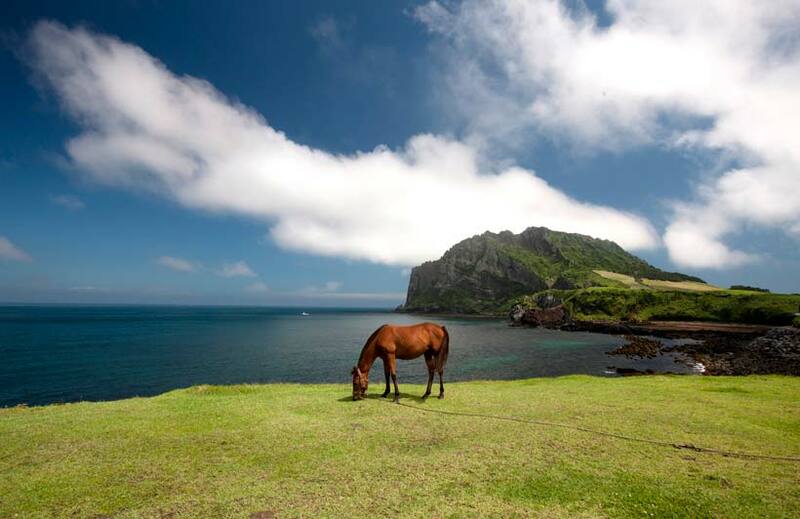 The ridge is an ideal path for walk and horse riding as well. 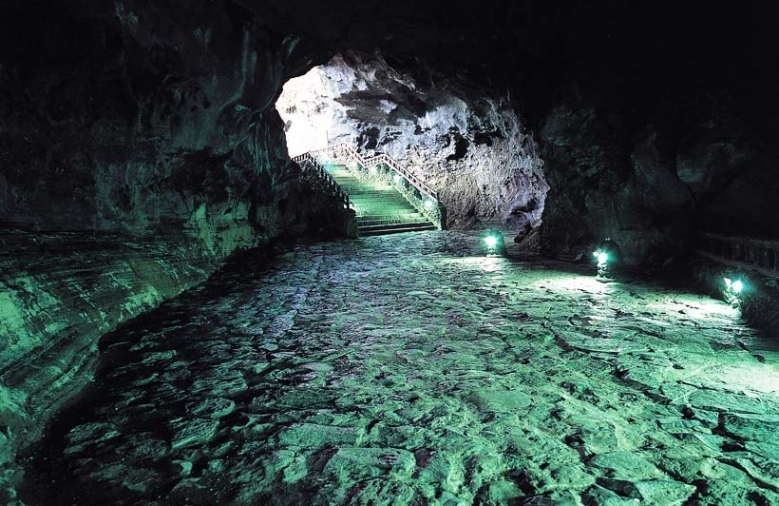 Manjang Cave is one of the finest lava tunnels in the world and is designated as a natural monument. 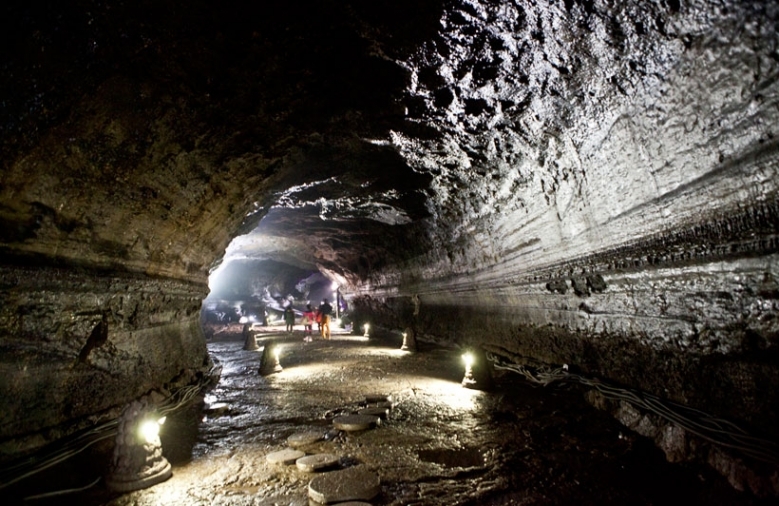 A tunnel is formed when the lava which was deep in the ground spouts from the peak and flows to the surface. 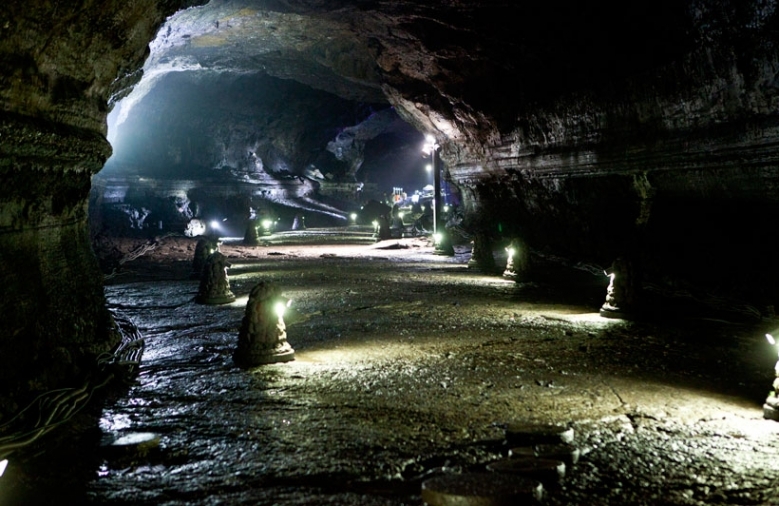 Manjang Cave has a variety of interesting structures inside including 70 cm lava stalagmites and the tube tunnels. 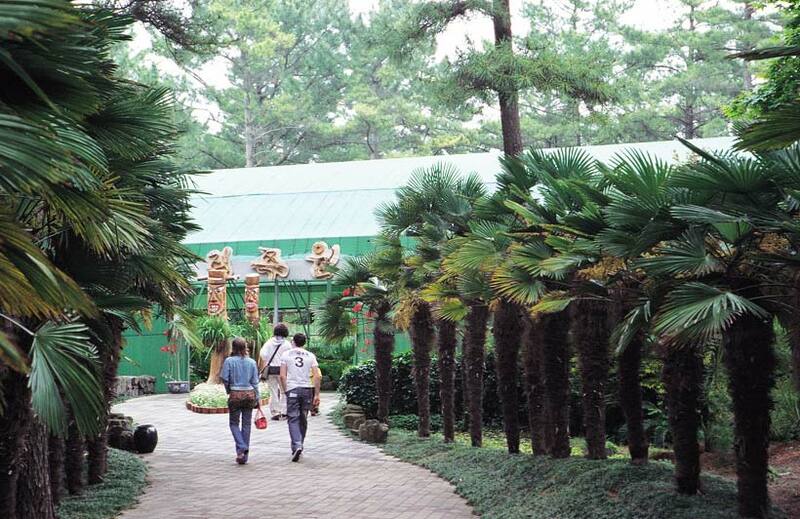 Hallim Park is located western 33 km away from Jeju City and West side of Mt. 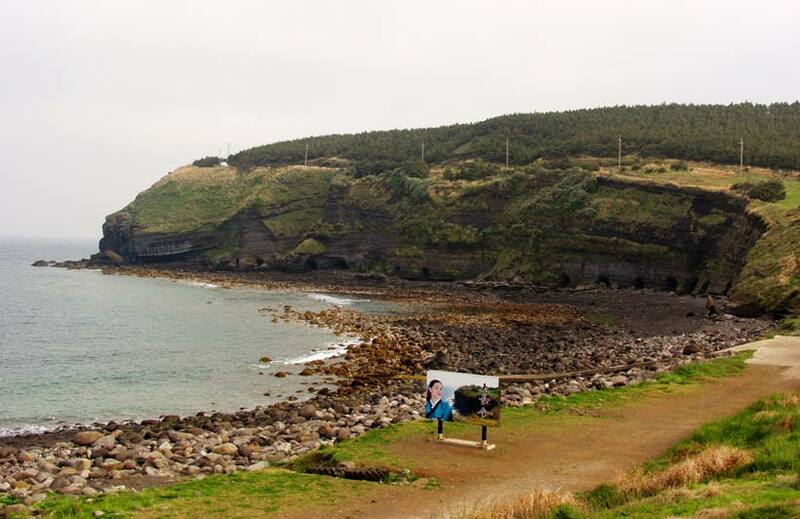 Hallasan along the beach in Hallimeup and is one of the most popular attractions on Jeju Island. 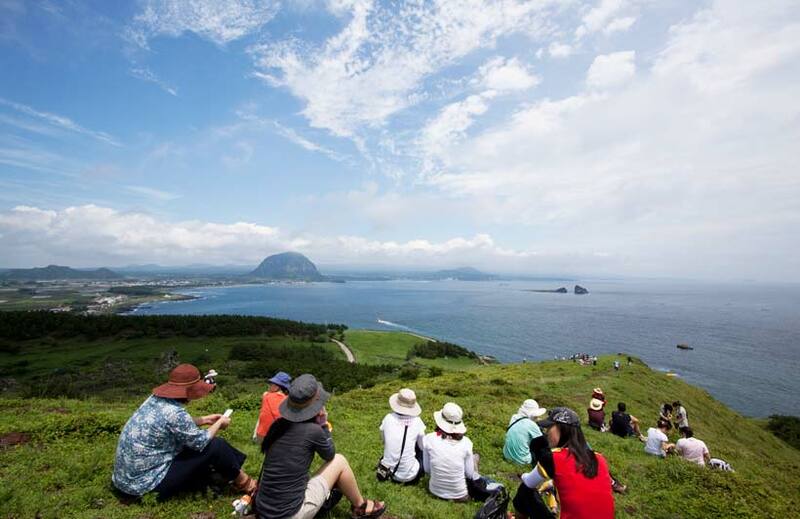 From the top of Suweolbong, you can view Chagwi Island, Dansan, Jukdo Islet and even Mt. Songaksan with a telescope. 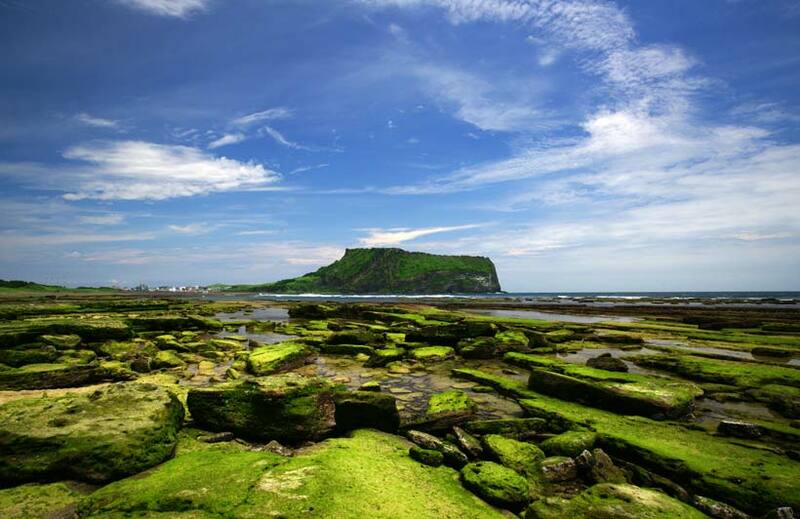 Suweolbong is also famous in a myth about a brother and a sister who were devoted to their parents. 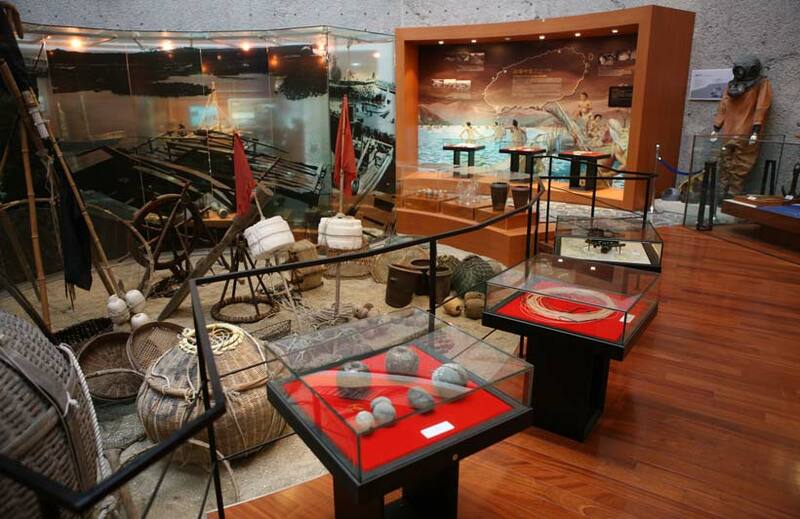 The O'sulloc Museum teaches tourists about traditional Korean tea culture. The "o" in "O'sulloc", means to appreciate and enjoy, and is also stands for the origin of sulloc, only sulloc and of sulloc tea. 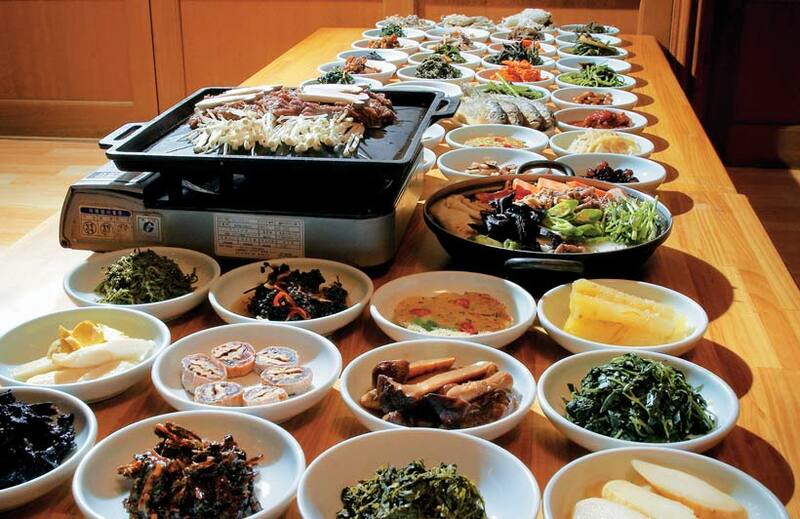 The healthy Korean buffet includes fresh vegetables and delicious local foods. 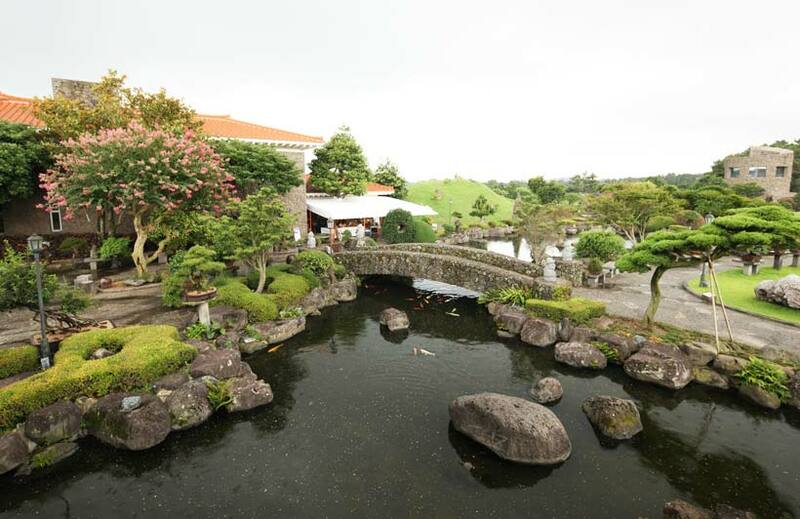 Refresh yourself at the beautiful Bonsai Garden with a wellbeing buffet. 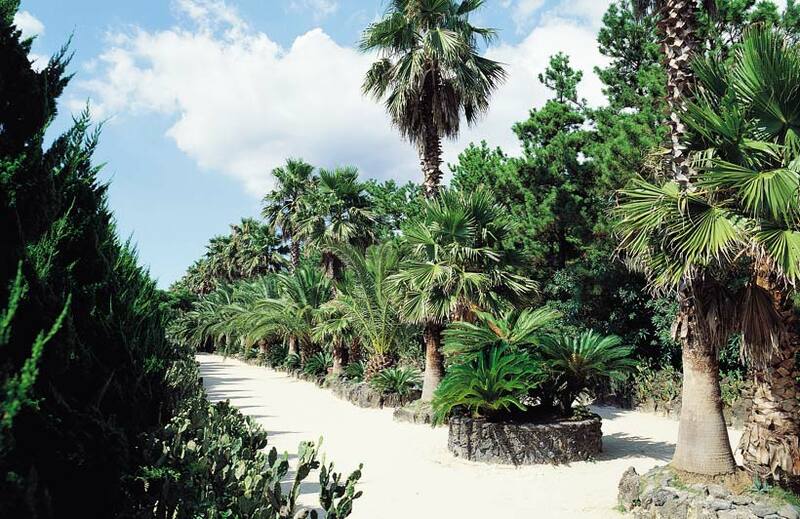 The Spirited Garden is the world's largest botanical garden with a total area of 39,700 m². 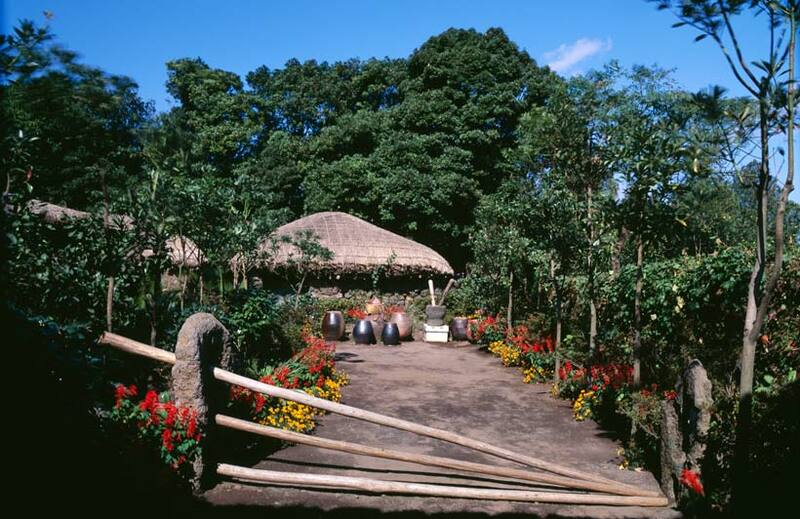 The garden has lots of maple trees, wisterias and pine trees with age range of 30 to 300 years. 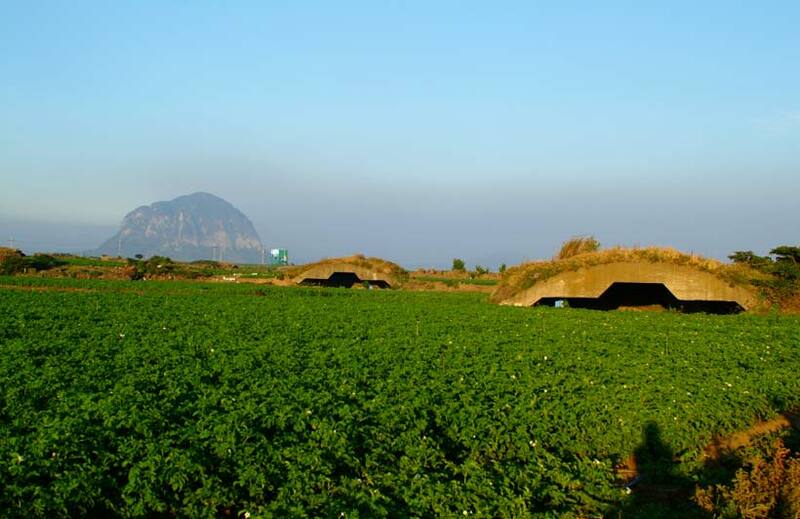 ALTHR Airfield is the place where you can feel today's peaceful Jeju Island compared to Jeju’s sad part of history. Mt. Sanbangsan is the result of a violent volcanic eruption approximately 700,000 to 800,000 years ago and is actually a huge body of lava. The cliff on the Southern side of the lava dome is full of lava formations and some of them are high as 200 m.
According to the ancient myth, Cheonjeyeon Waterfall means "the pond of the Gods" where nymphs used to take a bath. 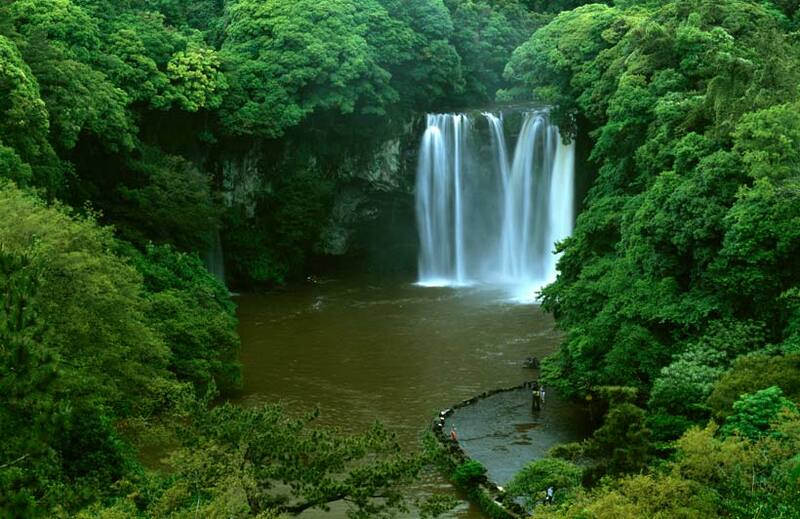 The first cascade of Chenjeyeon Waterfall is 22m high and the water forms a pond depth of 21m. The water flows further along to form the second cascade which is 30m high. 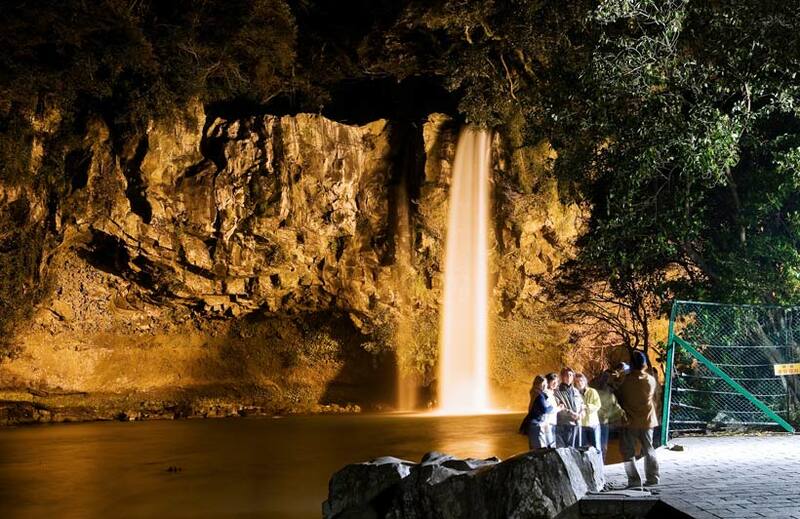 Above the Chenjeyon Waterfall, there is a stunning arch bridge (Senimkyo) which is also called Seven Nymphs Bridge. Water bounces from the precipice of the waterfall to the lower clay layer. 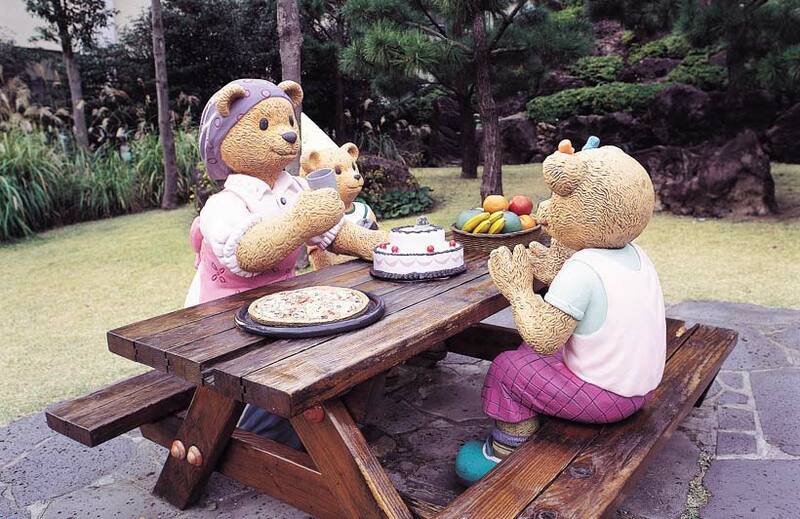 The Teddy Bear Museum displays a lot of interesting exhibitions including history and art of Seoul and a tour around the world, as well as a 100 year history of Teddy Bears. All teddy bears displayed are handmade by designers with premium goat’s wool to show its high quality. 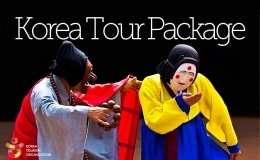 * After the tour, tourists who stay in the Jungmun or Seoqwipo area, can return to their accommodation via Limousine bus, and the bus fare will be provided.